Maria Montessori’s original observations of children, over one hundred years ago, stand true today: that children are naturally good, naturally peaceful, and naturally motivated to learn. The scientific principles of observation, analysis, reflection and action helped her to develop specific materials and methods for serving children. We believe these same principles can be used in Montessori classrooms today, to serve the children in the environment and to help translate Montessori’s original vision to the demands of our modern world. Maria Montessori was an Italian physician and educational theorist in the early twentieth century whose observations of children revolutionized the field of early childhood education. One of the first female physicians in Italy, Montessori had few opportunities to practice medicine and found herself working in large institutions with individuals with intellectual impairments. Montessori applied the same principles of the scientific method to her practice with young children in the institution, experimenting with materials, language and learning structures until she identified a strategy through which the institutionalized children were able to pass and excel on state achievement tests. Her curiosity led her to apply these same strategies with typically developing children although she remained limited in the environments open to her work. In 1906, Montessori convinced the owner of a tenement house in San Lorenzo, Rome, to give her the use of one of the apartments in the building in exchange for her promise to tend to the children of working families during the day. 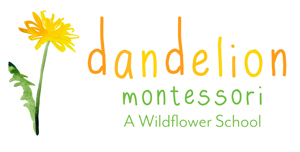 The first Montessori school was born. Over the next thirty years, Montessori continued to refine her model, lecturing on children’s development and learning around the world. Often received as a radical, Montessori nonetheless inspired a generation of teachers to create classrooms of their own, following her original principles and, over time, leading to the establishment of thousands of Montessori schools across the US and around the world. 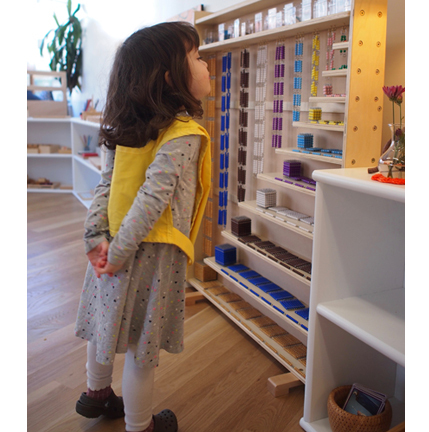 Today, the Montessori Method has been incorporated into schools of all kinds: private and public, small and large, and expanded to serve children as young as infancy and through the high school years. “A Montessori Morning” showing a three-hour work period in four minutes. You can click the menu at the top left to jump between videos. In addition, Michael Olaf is a material company that has a very thoughtful newsletter that families can subscribe to at no cost. Finally, some research on the benefits of a Montessori education over traditional educational models. Here’s a summary and a more detailed research article. The Montessori materials are truly the shining stars of the Montessori classrooms. 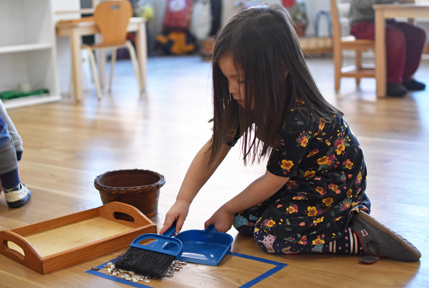 From simple materials that introduce pouring grains and spooning beans to advanced materials that expand on complex mathematical principles, the Montessori materials are designed to allow independent exploration of complicated concepts. Because the materials are so carefully designed to match what we understand about children’s development, the concepts included often surpass the content we typically expect of young children. High-quality, beautiful materials entice the child to explore challenging concepts in ways that reflect specific qualities of children’s growth. 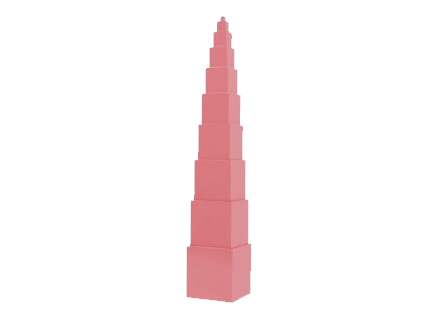 For example, the pink tower is comprised of ten pink wooden cubes ranging from a cubic centimeter to 10 cubic centimeters. The cubes increase progressively in the algebraic series of the third power. Therefore, the second cube equals eight of the first; the third cube equals 27 of the first and so on. The uniform color and texture of the blocks allow the child to focus only on dimension, and a child who stacks the tower in the incorrect order would eventually notice that the pattern of decreasing size is disrupted and try again. The multi-age classroom allows children to learn from each other, to explore a variety of social roles in authentic ways, and to cycle through periods of extraordinary growth and reassuring rest. Over the course of three years, children are learners and teachers, leaders and followers, sometimes engaged in independent work and sometimes engaged in work with other children. By the end of the three years, the child’s confidence, self-efficacy and ability to collaborate with others reflects these invaluable experiences as part of a reliable community. The Montessori teacher’s role differs from that of a traditional teacher. Montessori teachers are expected to act as scientists in the classroom, carefully observing each child’s development to prepare an environment which is specifically responsive to the needs of the children it serves. Montessori teachers facilitate children’s curiosity by matching individual lessons to individual children. In a carefully prepared environment rich in high quality materials and supported by expert teachers, the curriculum can closely follow the interests and rhythms of each child. Children choose the materials of interest to them and are introduced to new materials in the classroom when they are developmentally appropriate for the child. The teacher’s role is especially important to this model: teachers must be able to observe children carefully to determine the subtle cues that indicate a child’s readiness for differing work and must document each child’s development to assure steady and balanced development. Unlike “blank slate” models, Montessori presumes that the natural state of children is positive, that children will do the right thing if given the opportunity, and that when children’s behavior is less positive, it reflects some obstacle to the child’s natural state. We believe children are intrinsically peaceful. 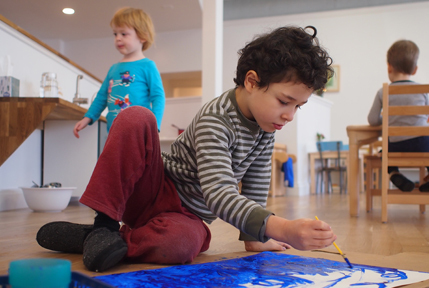 Montessori classrooms are often notable of their peaceful, gentle climate, within which children of differing ages and development seem to interact with each other with less conflict and more joy. We believe this is the natural condition of childhood so, when conflicts do occur, we look to the physical design of the classroom, the developmental differences between children, or the choices of the teacher to resolve. We believe children are intrinsically motivated to learn. 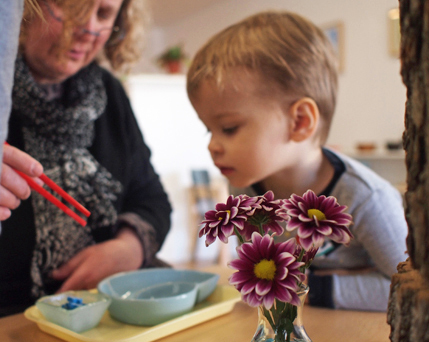 Montessori disavows traditional models of punishment and reward, believing that children’s motivation to learn is natural to them and continues to blossom in environments that allow authentic learning. Because we believe children to be intrinsically good, intrinsically peaceful and intrinsically motivated to learn, we look first to ourselves as the primary stewards of the classroom environment when challenges occur. We ask what we might do differently as adults to return the children to their natural state, rather than punishing or labeling children as problems to be solved.